Andrew Neiman is a first-year jazz student at the prestigious Shaffer Conservatory in New York City. He has been playing drums from a young age, and he aspires to become a world-class drummer like Buddy Rich. Famed conductor Terence Fletcher invites him into his Studio Band as the alternate for core drummer Carl Tanner. Fletcher is harsh on his students. When the band rehearses the Hank Levy piece "Whiplash" and Andrew struggles to keep the tempo, Fletcher hurls a chair at him, slaps him, and berates him in front of the ensemble. At a jazz competition, Carl’s folder is misplaced while Andrew is guarding it. Carl cannot play without it, and Andrew tells Fletcher that he can perform "Whiplash" from memory. After a successful performance, Fletcher promotes Andrew to core drummer. Soon after, Fletcher recruits Ryan Connolly, the core drummer from Andrew's former lower-level ensemble within the conservatory. Andrew believes Connolly is a less talented drummer than him, and is infuriated when Fletcher promotes Connolly to core. Determined to impress, Andrew practices until his hands bleed, and he breaks up with his girlfriend Nicole to focus on his musical ambitions. After a grueling five-hour audition with Fletcher and the other drummers in the class, in which Fletcher kicks furniture and screams at him, Andrew earns back the core spot. On the way to another competition, the bus Andrew is riding breaks down. He rents a car, but he arrives late, then realizes he left his drumsticks at the rental office. He races back to retrieve them, but after doing so his car is broadsided by a semi. He crawls from the wreckage, runs back to the theater, and arrives on stage bloody and injured. When he struggles to play "Caravan", faltering due to his injuries, Fletcher halts the performance and dismisses Andrew. Horrified and enraged at Fletcher's extreme lack of compassion, Andrew attacks Fletcher in front of the audience, after which he is dismissed from Shaffer Conservatory. At his father's request, Andrew meets a lawyer representing the parents of Sean Casey, Fletcher's former student, in an ethics complaint against Shaffer Conservatory. Contrary to Fletcher's prior claim that Sean died in a car crash, the lawyer explains that Sean hanged himself while Fletcher's student due to the latter's emotional and physical abuse. Sean's parents want to see Fletcher dismissed and forbidden from teaching again. Andrew agrees to testify as an anonymous witness and Fletcher is fired. Months later, Andrew has abandoned drumming and is working in a restaurant. He discovers Fletcher performing as a pianist in a combo at a jazz club. After the performance, Fletcher invites Andrew for a drink. He explains that he pushed his students so that they might become the next Louis Armstrong or Charlie Parker. Andrew accepts Fletcher's invitation to drum with his band at the JVC Jazz Festival. He invites Nicole to the performance, but she has a new relationship. On stage, just before the performance begins, Fletcher reveals that he knows Andrew testified against him, and starts the concert with a piece Andrew does not know. Andrew leaves the stage humiliated, but he returns, interrupts Fletcher by playing "Caravan", and cues the band. As the piece ends and the lights go down, Andrew continues his solo. Fletcher is taken aback, but begins to guide Andrew. As the solo ends, they share a smile and Fletcher cues the finale. While attending Princeton High School, writer-director Damien Chazelle was in a "very competitive" jazz band and drew on the dread he felt in those years. He based the conductor, Terence Fletcher, on his former band instructor (who died in 2003) but "pushed it further", adding elements of Buddy Rich and other band leaders known for their harsh treatment. Chazelle said he wrote the film "initially in frustration" while trying to get his musical La La Land off the ground. Right of Way Films and Blumhouse Productions helped Chazelle turn 15 pages of his original screenplay into a short film starring Johnny Simmons as Neiman and J. K. Simmons (no relation) as Fletcher. The 18-minute short film received acclaim after debuting at the 2013 Sundance Film Festival, winning the short film Jury Award for fiction, which attracted investors to produce the complete version of the script. The feature-length film was financed for $3.3 million by Bold Films. In August 2013, Miles Teller signed on to star in the role originated by Johnny Simmons; J. K. Simmons remained attached to his original role. Principal photography began the following month, with filming taking place throughout Los Angeles, including the Hotel Barclay, Palace Theater, and the Orpheum Theatre. Early on, Chazelle gave J. K. Simmons direction that "I want you to take it past what you think the normal limit would be," telling him: "I don't want to see a human being on-screen any more. I want to see a monster, a gargoyle, an animal." Many of the band members were real musicians or music students, and Chazelle tried to capture their expressions of fear and anxiety when they were pressed by Simmons. Chazelle said that between takes, Simmons was "as sweet as can be," which he credits for keeping "the shoot from being nightmarish". The film was shot in 19 days, with a schedule of 14 hours of filming per day. Chazelle was involved in a serious car accident in the third week of shooting and was hospitalized with possible concussion, but he returned to filming the next day to finish the film on time. The film was shot mostly in Los Angeles, with a few exterior shots filmed in New York City to create the setting. The soundtrack album was released on October 7, 2014, via Varèse Sarabande label. The soundtrack consists of 24 tracks divided in three different parts: original jazz pieces written for the film, original underscore parts written for the film, and classic jazz standards written by Stan Getz, Duke Ellington, and other musicians. Whiplash grossed $13.1 million in the U.S. and Canada and $35.9 million in other territories, for a worldwide total of $49 million against a budget of $3.3 million. In North America, the film opened in a limited release on October 10, 2014, in six theaters, grossing $135,388 ($22,565 per theater) and finishing 34th at the box office. Director Damien Chazelle at the 2014 Sundance Film Festival. Whiplash has a score of 93% on the review aggregation website Rotten Tomatoes, based on 284 reviews, with a rating average of 8.54/10. The site's critical consensus states, "Intense, inspiring, and well-acted, Whiplash is a brilliant sophomore effort from director Damien Chazelle and a riveting vehicle for stars J. K. Simmons and Miles Teller." On Metacritic the film has a score of 88 out of 100, based on reviews from 49 critics, indicating "universal acclaim". Simmons received wide praise for his performance and won the Academy Award for Best Supporting Actor. Peter Debruge, in his review for Variety, said that the film "demolishes the cliches of the musical-prodigy genre, investing the traditionally polite stages and rehearsal studios of a topnotch conservatory with all the psychological intensity of a battlefield or sports arena." Todd McCarthy of The Hollywood Reporter praised the performances of Teller and Simmons, writing: "Teller, who greatly impressed in last year's Sundance entry The Spectacular Now, does so again in a performance that is more often simmering than volatile ... Simmons has the great good fortune for a character actor to have here found a co-lead part he can really run with, which is what he excitingly does with a man who is profane, way out of bounds and, like many a good villain, utterly compelling." Whiplash also won the 87th Academy Award for Best Sound Mixing and the 87th Academy Award for Best Film Editing. Amber Wilkinson of The Daily Telegraph praised the direction and editing, writing: "Chazelle's film has a sharp and gripping rhythm, with shots, beautifully edited by Tom Cross... often cutting to the crash of Andrew's drums." James Rocchi of Indiewire gave a positive review and said, "Whiplash is ... full of bravado and swagger, uncompromising where it needs to be, informed by great performances and patient with both its characters and the things that matter to them." Henry Barnes of The Guardian gave the film a positive review, calling it a rare film "about music that professes its love for the music and its characters equally." Forrest Wickman of Slate said the film distorted jazz history and promoted a misleading idea of genius. In The New Yorker, Richard Brody said "Whiplash honors neither jazz nor cinema". The film received the top audience and grand jury awards in the U.S. dramatic competition at the 2014 Sundance Film Festival; Chazelle's short film of the same name took home the jury award in the U.S. fiction category one year prior. The film also took the grand prize and the audience award for favorite film at the 40th Deauville American Film Festival. 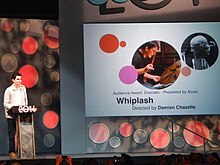 Whiplash was originally planned to compete for the Academy Award for Best Original Screenplay, but on January 6, 2015, the Academy of Motion Picture Arts and Sciences (AMPAS) announced that the film would instead be competing in the Adapted Screenplay category to the surprise of many, including Chazelle. Although the Writers Guild of America categorized the screenplay as original, AMPAS classed it as an adaptation of the 2013 short version. At the 87th Academy Awards, J. K. Simmons received the Academy Award for Best Supporting Actor for his performance, Tom Cross won the Academy Award for Best Film Editing and Craig Mann, Ben Wilkins and Thomas Curley won the Academy Award for Best Sound Mixing. In December 2015, the score received a Grammy nomination, and the film was nominated for the NME Award for Best Film. ^ The Academy of Motion Picture Arts and Sciences recognizes the movie as being based on the short film of the same name by Chazelle, due to the short being premiered in the Sundance Film Festival a year prior to the theatrical film being released. Although, in reality, the short film was actually based on scenes of the original full-length script written before, and the short was created to attract investors into creating the full-length film. ^ a b Bahr, Lindsey (May 14, 2013). "'Whiplash': Sundance-winning short to become full-length feature". Entertainment Weekly. CNN. Retrieved January 19, 2014. ^ "Whiplash". British Board of Film Classification. August 5, 2014. Retrieved November 12, 2014. ^ a b c d "Whiplash (2014)". Box Office Mojo. Retrieved November 9, 2015. ^ Cohen, Sandy (January 17, 2014). "Sundance Film Festival 2014 opens with premiere of 'Whiplash,' Damien Chazelle's tale of a brutal drumming instructor and his protege". The Oregonian. Associated Press. Retrieved January 18, 2014. ^ a b Horn, John (January 16, 2014). "Sundance 2014: Sony grabs international rights to 'Whiplash'". Los Angeles Times. Tribune Company. Retrieved January 19, 2014. ^ a b c Dowd, A.A. "Whiplash maestro Damien Chazelle on drumming, directing, and J. K. Simmons". The A.V Club. Retrieved December 30, 2014. ^ Hammond, Pete. "Damien Chazelle's La La Land, An Ode To Musicals, Romance & L.A., Ready To Launch Venice And Oscar Season". Deadline Hollywood. Retrieved September 20, 2016. ^ Dowd, A. A. (September 21, 2016). "Two takes on Whiplash show that J.K. Simmons is scary in small doses, too". The A.V. Club. ^ a b "2013 Sundance Film Festival Announces Jury Awards in Short Filmmaking". www.sundance.org. January 23, 2013. Retrieved January 21, 2019. ^ Fleming, Jr., Mike (May 14, 2013). "Cannes: Bold, Blumhouse, Right Of Way Strike Up Band For Feature Version Of Sundance Short Whiplash". Deadline Hollywood. Penske Media Corporation. Retrieved January 19, 2014. ^ Fleming, Jr., Mike (August 5, 2013). "The Spectacular Now's Miles Teller Gets Whiplash". Deadline Hollywood. Penske Media Corporation. Retrieved January 19, 2014. ^ McNary, Dave (September 19, 2013). "Jake Gyllenhaal's Nightcrawler Gets California Incentive (Exclusive)". Variety. Penske Media Corporation. Retrieved January 19, 2014. ^ "Tuesday, Sept. 24 Filming Locations for The Heirs, Undrafted, Dumb & Dumber To, Focus, Shelter, & more!". On Location Vacations. September 24, 2013. Retrieved January 19, 2014. ^ a b "Making of 'Whiplash': How a 20-Something Shot His Harrowing Script in Just 19 Days". The Hollywood Reporter. December 9, 2014. Retrieved March 4, 2015. ^ a b "Producer: Whiplash was filmed in 19, 14-hour days". Page Six. February 9, 2015. Retrieved March 4, 2015. ^ "Whiplash Soundtrack Details". filmmusicreporter.com. Retrieved April 10, 2017. ^ "Whiplash (2014)". Rotten Tomatoes. Fandango Media. Retrieved March 9, 2019. ^ "Whiplash". Metacritic. CBS Interactive. ^ Smith, Nigel M (October 15, 2014). "J. K. Simmons on His Whiplash Oscar Buzz and Abusing Miles Teller". indieWire. Retrieved October 15, 2014. ^ Riley, Jenelle (September 3, 2014). "J. K. Simmons on Playing a 'Real' Villain in Whiplash". Variety. Retrieved September 3, 2014. ^ "Sundance Film Review: Whiplash". Variety. Retrieved January 19, 2014. ^ "Whiplash: Sundance Review". The Hollywood Reporter. Retrieved January 19, 2014. ^ a b "Whiplash: Sundance 2014 – first look review". The Guardian. Retrieved January 19, 2014. ^ "Sundance 2014: Whiplash, review". The Telegraph. Retrieved January 19, 2014. 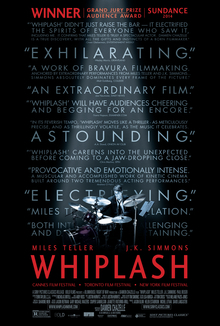 ^ "Sundance Review: Whiplash Starring Miles Teller Leads With The Different Beat Of A Very Different Drum". indieWire. Archived from the original on February 19, 2015. Retrieved January 19, 2014. ^ Wickman, Forrest (October 11, 2014). "What Whiplash Gets Wrong About Genius, Work, and the Charlie Parker Myth". Slate. Retrieved October 13, 2014. ^ Brody, Richard (October 13, 2014). "Getting Jazz Right in the Movies". The New Yorker. Retrieved February 5, 2015. ^ Zeitchik, Steven; Mark Olsen (January 25, 2014). "Sundance 2014 winners: 'Whiplash' wins big". Los Angeles Times. Retrieved January 27, 2014. ^ Richford, Rhonda (September 13, 2014). "'Whiplash' Takes Top Prize in Deauville". The Hollywood Reporter. Retrieved September 13, 2014. ^ Tapley, Kristopher (January 6, 2015). "Oscar surprise: 'Whiplash' deemed an adapted screenplay by Academy". HitFix. Retrieved January 6, 2015. ^ a b Hammond, Peter (January 6, 2015). "Academy & WGA At Odds Over 'Whiplash' Screenplay; Will It Hurt Oscar Chances?". Deadline Hollywood. Retrieved December 28, 2017.